ATN NVWSNAR2C0 Night Arrow 2 - CGT Night Vision Weapon Sight FREE SHIPPING! The Night Arrow 2 Night Vision Weapon Sight from ATN is a lightweight, high quality low-light scope that makes target acquisition and accuracy easy. It attaches to a standard Weaver rail, allowing for compatibility with a wide range of firearms. All external, non-optical surfaces feature a non-reflective black finish to ensure maximum stealth while in the field. The high-resolution CGT intensifier and multi-coated optics provide a clear, high-contrast image, while automatic brightness adjustment and bright light cut-off features produce a consistent image while protecting the tube. When ambient light levels drop to zero, the detachable infrared illuminator ensures visibility. The scope comes with a high-contrast, red-on-green reticle for maximum visibility against all backdrops, as well as finely adjustable windage and elevation controls for pinpoint accuracy. 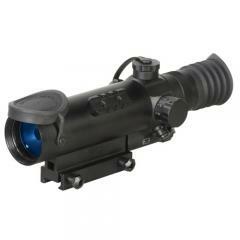 ©2002-2019 CopsPlus.com: ATN NVWSNAR2C0 Night Arrow 2 - CGT Night Vision Weapon Sight FREE SHIPPING!